It’s obviously been a while since I have put a post up. Feels good to write again so hopefully I can find time to do it more often. 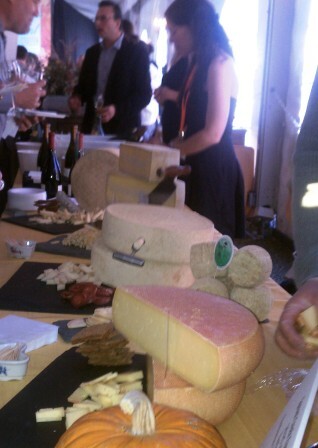 This piece for the NYCR focuses on a revisit to the cheeses from Sprout Creek Farm. The last time that I officially tasted their cheeses, I left with mixed results. In the end, I more or less attributed it to improper storage and cheese care at the shop I purchased from. I am glad that I had an opportunity not only to taste again, but also discuss some of the finer points of technique with the cheesemaker. I recently had the opportunity to attend the annual Taste of the Hudson Valley. Each year, local restaurants and artisans are given the opportunity to shine as they pair a couple of dishes with wine, beer, or other beverages of their choosing. The event is always well-attended as ticket holders move from table to table, chat with local chefs, sip wine, and comment on the successfulness of a particular pairing. It’s a great time, but the purpose of this post is not to talk about the use of Hudson Valley Foie Gras, butternut squash soup, or local wine and beer. This cheese geek found the Sprout Creek Farm table, and I was anxious to chat with the cheesemaker to delve a bit deeper behind the scenes. You can read the rest of my post for the NYCR here. ← The Role of “Affinage ” in Making Great Cheese.